College is full of unknowns, especially if you’re a freshman, but one of the scariest possibilities that can keep soon to be students up at night is the mysterious and dreaded “random roommate.” So you’re saying that I have to share my already minuscule dorm room, where I eat, sleep, and Netflix binge, with a complete and utter stranger?? It’s a daunting thought. But it doesn’t necessarily have to be. Keep these helpful tips in mind when preparing for your new roommate and with a bit of luck and a friendly attitude, you may just survive this. Make “random” less random: Some universities may offer the opportunity to selectively choose certain characteristics you wish your roommate to have when completing your housing application. These things can include their cleanliness habits, sleeping schedules, and sometimes even personality traits. If at all possible, complete these questionnaires so that even if your future roomie and you aren’t the best of friends, you aren’t constantly squabbling over trivial matters. Facebook Stalking Doesn’t Count as Getting to Know Each Other: It is absolutely key to attempt to make at least some form of contact with your future roommate, whether it be over text, Facebook, or email. Introduce yourself, get to know each others interests, and collaborate on what you still need to buy for your room. If they seem willing, strive to get to know them a little better based off of their communication instead of their Facebook statuses or Instagram posts - social media can be misleading! Go on a Date: If at all possible, try to find a way to meet in person sometime before move-in day, whether it be getting some coffee, meeting at a local Target to buy dorm supplies, or just spending some time together. This allows the two of you to get to know each other face to face before being forced into a small living space together for a semester or two. Not to mention, it’s nice to be able to see a familiar face on move-in day! Keep Your Expectations Flexible: This experience, however nerve wracking, must be handled with an open mind and a positive and respectful attitude. Remember that your roommate does not need to be your best friend in college, but it does help to maintain a friendly and open atmosphere so you can both feel comfortable around each other and the space you live in. Especially during the first couple weeks of school, it is important to respect your roommate’s personal belongings, their space, and especially their emotions. Use the Buddy System: Finally, never forget the benefits of the buddy system. Though this may not be enforced like it was in elementary school, the buddy system is a great way to get out of your comfort zone and meet new people. If you and your roommate get along, accompany each other to a game of ultimate frisbee, events hosted on campus, or even just down the hall to meet other people on the floor. Even if you and your roomie aren't great friends, it helps to not take these vital first steps alone. Furthermore, if you and your roommate do not connect or naturally make friends in different groups, try not to be offended or feel guilty. Instead, remain friendly and supportive and resolve any conflicts right away so that you and your roommate can remain living together peacefully. Hello future and present college students. We're DormBedding.com, the leader in college dorm bedding supplies and accessories. Thanks for stopping by the blog and make sure to check out our website if you are in need of a style boost for your dorm. Thanks for sharing an interesting as well as surviving post. I loved the tactics you have mentioned in your post. Keep contributing!! 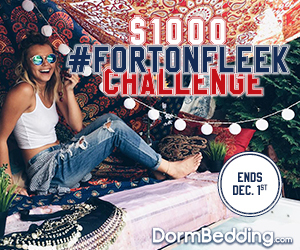 DormBedding.com is the leader in college dorm room bedding and accessories online, taking the hassle out of finding the elusive twin and full extra-long size bedding products. How Often Should College Students Wash Their Twin XL Bedding? 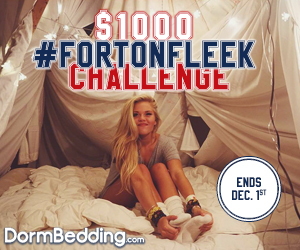 The $1,000 #FortOnFleek Challenge Winner Has Been Announced!! DormBedding.com is the leader in college dorm room bedding and accessories online, taking the hassle out of finding the elusive twin and full extra-long size bedding products. We carefully select our product line to offer a premium selection of sheets and comforters which feature the latest designer styles and colors.